With an impressive length of 100 cm, hyacinth macaw is the largest of all flying species of parrots in the world. They inhabit in semi-open areas and savanna grasslands of Northern Brazil. Their population have been declined in past few years. Today, less than 5000 Hyacinth Macaws left in the world. Habitat loss and hunting are main threats to hyacinth macaw. Besides the large size, Hyacinth Macaw is famous for their striking cobalt blue plumage with bright yellow rings around the eyes. 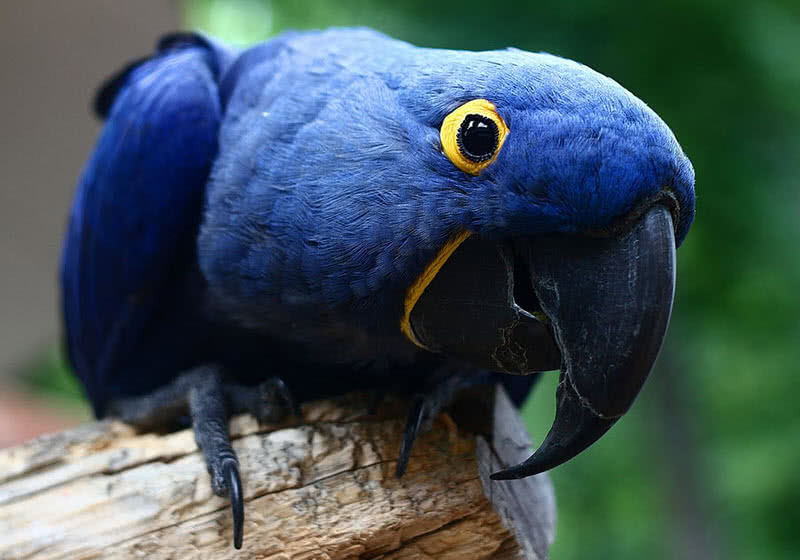 Due to this stunning coloration, Hyacinth Macaw also called as ‘blue macaw’. They also have a beautiful long tail and strong and curved black bill. With proper training, Hyacinth Macaws could be an excellent pet. To make them comfortable, You should also give them a lot of space. They are very playful and not so good at imitating words like some other members of Macaw family. You should be aware of powerful bill of Hyacinth Macaws. It can’t be guaranteed that they won’t bite you even with proper caring and training. The Hyacinth Macaws also can be extremely loud when they are in a group. Female wood ducks are not so colorful as males. They have grey-brown head, white belly and white speckled breast. Male bird uses their colorful plumage to attract female bird during breeding season. 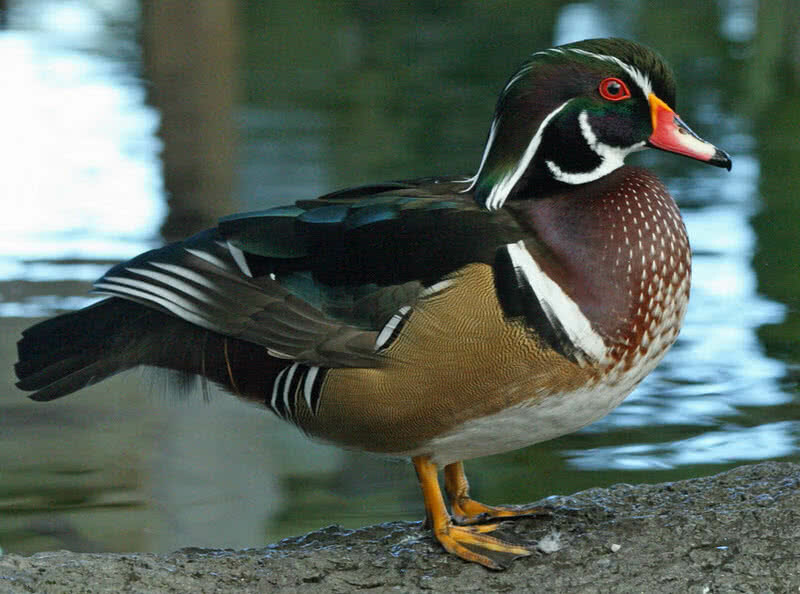 wood ducks inhabit in marshes, wooded swamps and streams across North America. With unique coloration and shape, the wood ducks are also one of most easily recognizable birds in the North America. Unlike other water fowls, wood ducks nest in tree holes and form flocks. Bohemian waxwing is a medium-sized songbird with distinctive crested head and black masks. They are brownish-grey overall and wings have white and yellow edging. Thus, Bohemian Waxwing is among the most beautiful passerine birds in the world. 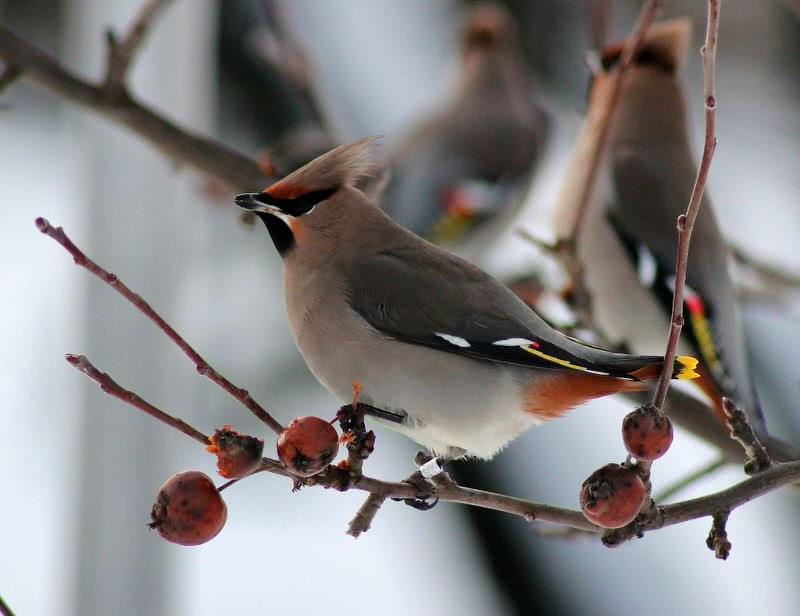 Bohemian waxwings inhabit in boreal forest across North America and Eurasia, mostly in Canada and Alaska. In winter, they migrate in large flocks to the Northwest parts of the United States. They nest on tree branches. Both male and female Bohemian Waxwings are known for their high pitched calls. They mainly feed on insects and berries. Besides the striking appearance, blue jays are famous for their intelligence. They may steal nestlings and eggs of other birds. 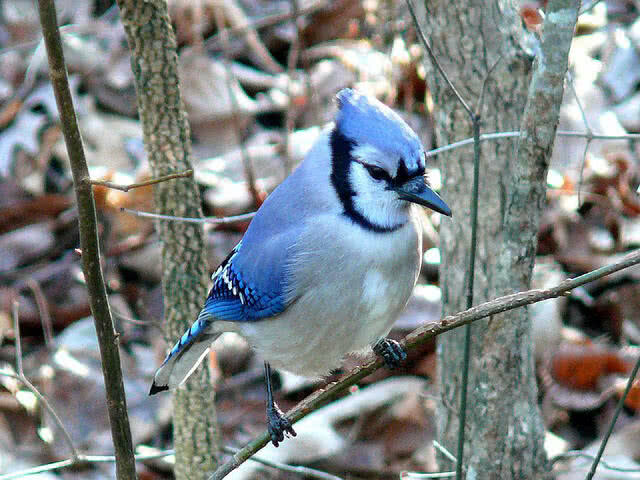 Blue jays also mimic the voice of hawks to deceive other birds. It is said to blue jays in captivity also could mimic human speech and the voice of other pets. Blue jays are social birds that found in small flocks. But in winter, during migration to the South, they form large flocks of hundreds of blue jays. Their migration behavior still remains a mystery among scientists. Not all blue jays migrate during winter, some birds remain in their natural territory. Also, no blue jays migrate every year. 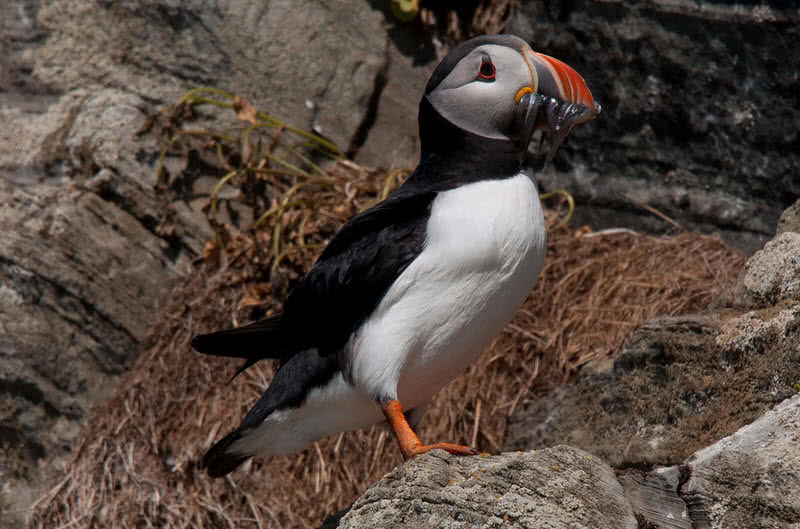 Atlantic puffin is a small, well-adapted seabird that found across the coast of Northern United States and Eastern Canada. Atlantic puffins are also known as ‘sea parrot’ due to their huge, multi-colored bill and penguin-like coloration. Atlantic puffins spend most of their lives on sea. Their water-resistant feathers keep their body warm while swimming. They flap their wings to swim on the surface and underwater. Atlantic puffins have excellent diving capability. They can reach up to 60 m on diving. They typically hunt sand eels, capelins and hakes. Atlantic puffins are also excellent fliers. They can reach a speed of 55 miles an hour by flapping wings up to 400 times per minute. They breed in each summer and spring on the islands of North Atlantic Ocean. They build nest using feathers and grasses in the burrows on the cliffs. The female lays only one egg and it takes 45 days to hatch it. After hatching, adult puffins leaves the nest for finding food for the chicks. They bring back small fishes for their chicks. Atlantic puffins can load between 10-30 fishes in their huge beaks. In spite of heavy appearance, beak of the keel-billed toucan is hollow and light. It is made up of one type of proteins called keratin. 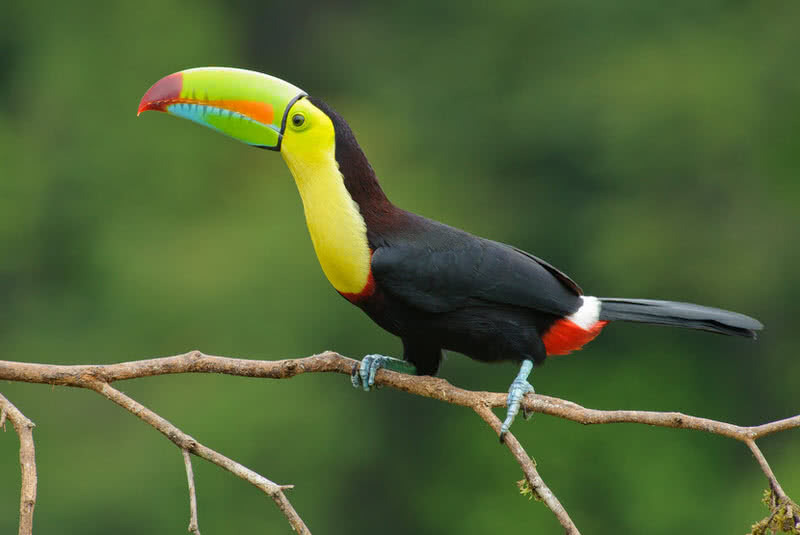 They use this large, colorful beak to attract female during the breeding season and also as a defensive weapon. This beautiful bird inhabit in the forest across Central and South America. They have a length of 20 cm and weigh up to 4 kg. Their plumage is mostly black with a yellow throat and chest. Keel-billed toucans are poor flyers due to their heavy wings. They can only move between the tree branches by hopping. Keel-billed toucans are very social birds. They form small flocks that contain up to thirty birds. They live in either natural or woodpecker made holes in trees. Their diet mainly consists of insects, lizards, and eggs. Peacocks can grow up to 5 feet in length, which make it one of the largest flying birds in the world. In fact, the long tail of a peacock makes 60% of its total length. 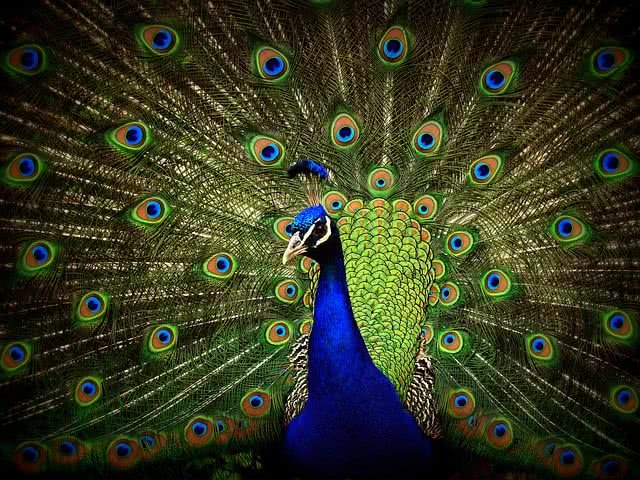 The colorful tail feather display of peacocks is probably the most beautiful courtship display among bird family. On courtship display, peacock spread out its enormous tail feathers to display the colorful patterns and eye spots. Some peacocks have a lengthy tail and more eyespots than others. The female peafowl or peahen also chooses a peacock with lengthy tail and more eye spots. Depending on the angle of reflection of light, color of the tail feathers of peacock looks different. An adult flamingo measure 4-5 feet in length and up to 3.6 kg in weight. Their neck is long and lean and has a distinctive downward, bend beak. The legs of flamingos are also very long, measure between 30 and 50 inches. The long leg and specially adapted beak let them to catch small fishes, larvae and planktons from the mud. Flamingos live in large colonies that include thousands of members. Their striking red-purple color is due to the food they eat. Their diet mainly consists of brine shrimp, plankton, and blue-green algae. Flamingo also spends hours on oil up their plumage from the special glands using their plumage. It helps them to keep their plumage always in good condition. 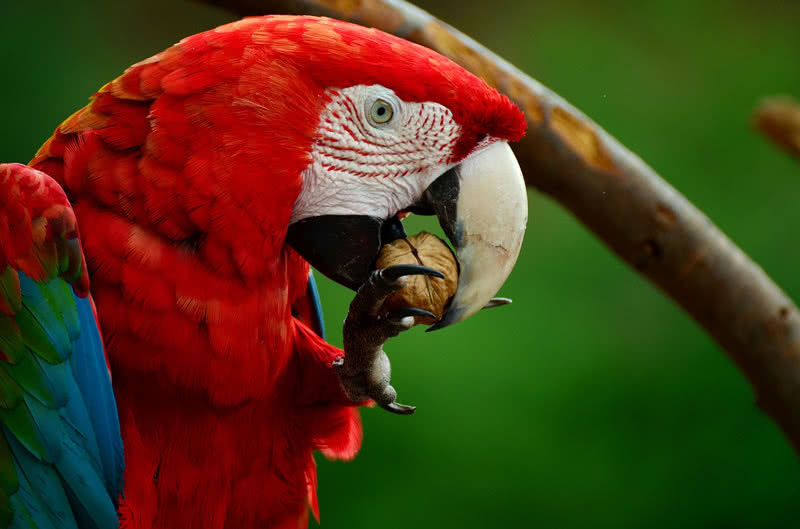 Scarlet macaw is one of the most beautiful and largest member of macaw family. They inhabit in humid evergreen forests across Central and South America. They are famous for their colorful plumage. They have bright red plumage with a blue back. Their upper wings are yellow and edged with green color. The strong, curved beak is another noticeable feature of a scarlet macaw. Its upper part is white and the tip is black. An adult scarlet macaw has a length between 80-90 cm and weighs up to 1.5 kg. They are excellent fliers and can reach up to a speed of 35 mph. Scarlet macaws also live for a long time. They have a lifespan of 40-50 years. It is said to be the scarlet macaws in captivity can live up to 75 years. The magnificent, scarlet macaw is also among the most intelligent birds in the world. In captivity, they can easily learn words, sounds and tricks. It is said to be a well trained scarlet macaw could even distinguish the colors and shapes. Scarlet macaws are also very loud parrots. They make different types of voices such as screeches and squawks. Their diet mainly consists of nuts, seeds, fruits and insects. With the strong, curved beak, scarlet macaws can easily break any nuts. Golden pheasants are famous for their brilliant colored plumage. They have a beautiful golden-yellow crest tipped with red. Their underpart is bright red and face. Sides and throat are rusty tan. 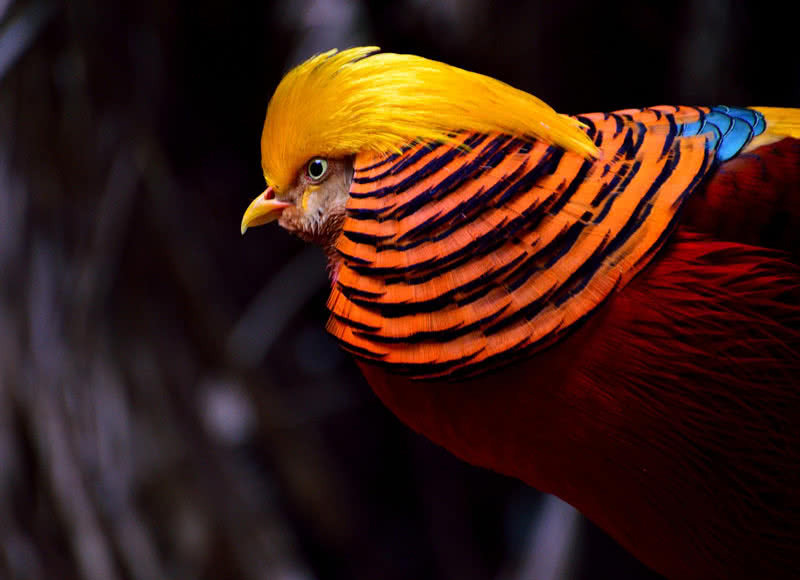 The wattle of golden pheasant is yellow and its upper back is green. 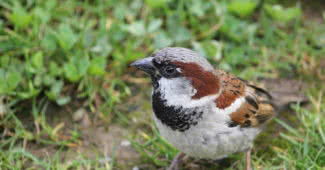 They also have dark, red shoulder feathers and a long pale brown tail. The male golden pheasants are more colorful than males. They have distinctive scarlet breast and flanks. Their central tail feathers also have striking black spots. Unlike male pheasants, females have a duller mottled brown plumage. Golden pheasants live in the dense forests and woodlands across Western and Central China. Male golden pheasants are longer than females. An adult male normally has a length up to 42 inches. Interestingly, the tail account for two-third of its total body length. Golden pheasants are poor fliers and spend most of their time on the ground. They mainly feed on berries, seeds and insects. There are about 10000 species of birds in the world. Each species is unique in many ways. They different in the beauty of plumage, size, call, migrating behavior, courtship displays, and feeding. So, when talking about the most beautiful birds in the world, different people have different opinions. Because beauty is the mind of the beholder. So, please feel free to share your opinions on this topic in the comment section below.